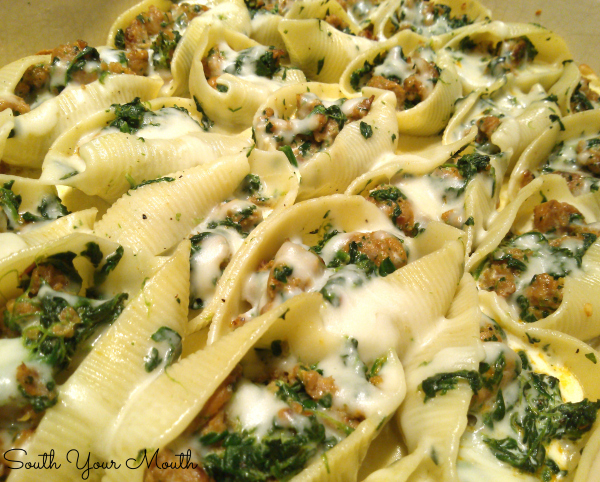 A rustic, simple recipe for stuffed pasta shells with Italian sausage, spinach and mozzarella topped with an easy garlic cream sauce. I love sausage. Like, to the point that most people love bacon. I really only cook bacon to get the drippings for cooking with. I would rather have sausage any day of the week. And I really love Italian sausage. I often use Italian sausage instead of ground beef when making weeknight spaghetti. TIP: easily make mini meatballs using Italian Sausage links by removing the casings then pinching off little one-inch pieces of sausage then rolling them into little meatballs. I make a more traditional recipe for Classic Stuffed Shells using tomato sauce (that is GREAT for serving guests and even freezing) but I wanted to change things up. 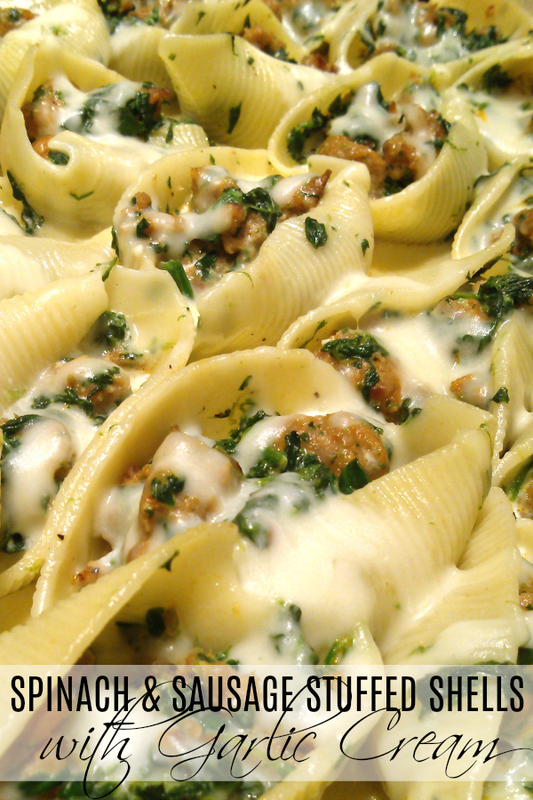 So I had the idea to make these stuffed shells using mostly just Italian sausage and spinach. And while I'd usually serve stuffed shells with marinara or some other red sauce I decided to go with an alfredo-type sauce with this recipe because sausage and spinach just go with cream sauce! This Garlic Cream Sauce is super simple to make but you could totally skip it and just use a prepared jar or tub of alfredo sauce from the grocery store. 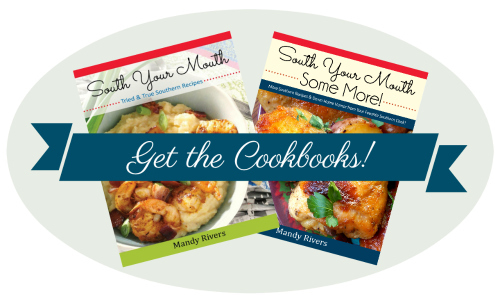 Trust me, I know all about going the quick and easy route when you're trying to get supper on the table quickly! But this sauce is super simple and easy and packs an amazing punch of fresh, homemade flavor. And, it’s really frickin easy. Now, all that being said, you could totally skip the creamy sauce and just use marinara sauce or your favorite spaghetti sauce too. Just use whichever you prefer! Prepare Garlic Cream Sauce first so that it can be doing its thing while you’re cooking everything else. Add cream and smashed garlic to a small saucepan and cook over medium heat until simmering, stirring occasionally (to smash your garlic, just lay your chef’s knife over each clove and give it a good whack or two). Once sauce begins to simmer, add salt and reduce heat to medium-low. Continue simmering, uncovered, for 15-20 minutes or until sauce coats the back of a spoon, stirring occasionally. Whisk in parmesan cheese and continue cooking over low heat for 2 minutes. Remove from heat until ready to use. Cook shells in liberally salted water per manufacturer’s instructions for al dente preparation. Drain and set aside. Meanwhile, crumble sausage in a large skillet and cook until nicely browned. Remove sausage with a slotted spoon and place in a large mixing bowl. Add drained spinach to sausage then stir well. And when I say “drained” I really mean it. I usually have to wring it out with my hands to get all the water out of it. Add 2 cups mozzarella and salt and pepper to taste then stir to combine. Spray a 13x9 (or 14x10) baking dish with cooking spray. Stuff shells with sausage mixture then arrange in baking dish. If you have any sausage mixture left over, just spoon it in between the shells. Sprinkle remaining 1 cup of mozzarella over shells. Fish garlic pieces out of garlic cream sauce then spoon sauce over and into stuffed shells. Cover dish with aluminum foil then bake at 350 degrees for 30 minutes or until sauce is bubbly and cheese is melted. I'm so glad you told me! I'd wondered about doing the same thing! 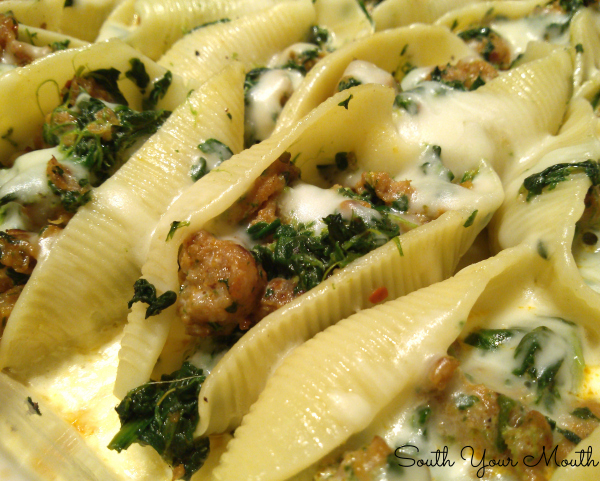 I think I'll try it and call it Sausage & Spinach Pasta a la Karen! Any ideas what to sub for the cream? I can find soy mozzarella cheese and parmesan but the cream?